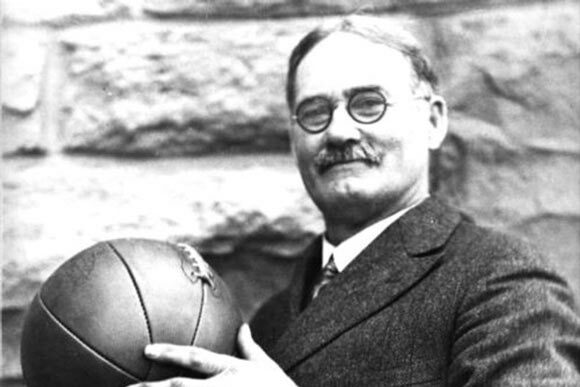 The innovator of the Basketball game, James Naismith, a physical education teacher by profession, was born on November 6th, 1861 in Almonte, Ontario. He received his early education from a private school and later attended McGill University in Montreal. He served as a sports director at the university and then moved to Young Men’s Christian Association, in 1891. He studied physical education from his native school in Montreal where he discovered Basketball in 1891. It was one day at his training school when he took a soccer ball and a basket and invented the game. The inspiration of this game was hooked by this game Naismith played when he was a kid. The game was called Duck-on-a-Rock. Further to his invention, he also wrote the first ever rulebook for Basketball which explored various rules and regulations followed even today. In 1983, he replaced the basket with iron nails and a hammock. The rulebook named the “Thirteen Official Rules” followed this. At the age of 35 he studied medicine in Denver followed by his MD in 1898 after which he moved to University of Kansas for his services as a teacher. During his tenure he was also the basketball coach for University of Kansas for nearly a decade. His expertise in basketball led him to shape a team of skilled basketball players which is known today as Kansas Jayhawks. He became a U.S national in 1925. As basketball grew to be one of the most played and emerging sport in the world, Naismith as an inventor and coach was awarded with various honors and prizes namely Canadian Basketball hall of fame, Canadian Olympic Hall of fame and McGill University Hall of Fame. In 1963 the first ever basketball game was aired on the television and since then the game has won many hearts and has emerged as one of the most popular games in the history. It was added into the Olympics in summers 1936. The Naismith Memorial Basketball Hall of Fame was named after him and in his honor in 1959. Naismith not only performed services as a sportsman and teacher, he was also a national Guard chaplain with Kansas Infantry regiment. As they say “it’s hard to avoid what you love” Naismith taught his fellow soldiers how to play basketball which helped them control their excess energy. Naismith’s personal life was a bit of a tragedy itself. He got married to Maude Evelyn Sherman in 1870 and had 5 children with her. Unfortunately she died in 1937 after which Naismith married Florence B. Kincaid. This marriage wasn’t successful either as he suffered a major brain hemorrhage in November the same year and died 9 days later. James Naismith was buried with his first wife in Memorial Park Cemetery in Lawrence Kansas. He had a very long list of achievements and positions held. Starting from a common school boy, he became the inventor or Basketball, a lecturer at University of Kansas, a gold medalist athlete and a Soldier. In June 2013 Dr. Naismith’s name was written in Kansas Hall of Fame during ceremonies in Topeka.